Many consumers who are in the market for a new crossover SUV choose the Hyundai Santa Fe. It is a popular model among consumers because it comes with a plethora of advanced features. Here at Victorville Hyundai, our team has a goal to keep our customers informed about our models, so you can read further to learn about a few safety features of the Santa Fe. Rear Occupant Alert is an available safety feature that is offered with the Santa Fe. This feature uses an ultrasonic sensor to monitor for children and pets in the rear seats. Before you exit the SUV, this system will send you a reminder to check for pets and children in the back seats. When motion is detected after you have exited and locked the SUV, the horn will sound. You will also be sent an alert on your smartphone through the Blue Link car connected system. The Santa Fe also comes with Rear Cross-Traffic Collision-Avoidance. 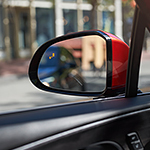 This system uses the radar sensors from the Blind Spot Detection System to monitor for vehicles that are approaching from the sides when the SUV is in reverse. It will send you an alert if a vehicle is detected, and it can engage the automatic brakes to help you avoid a collision.